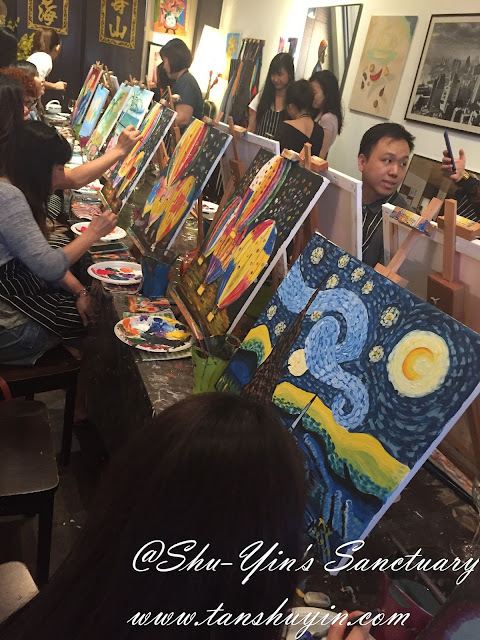 My sis went to this Artsy Sip place for her company's team building session. She had fun there and so she jio (invited) me there. 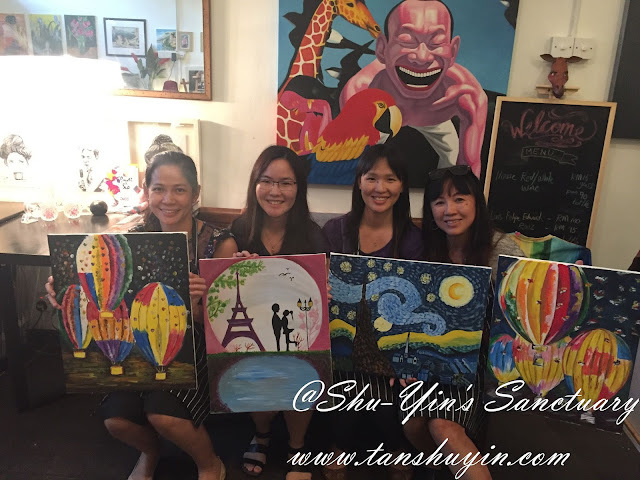 And so last weekend, my sis, mum, my cousin sil and me went over to Artsy Sip at Nagore Square, Penang. So what we got is this. They supplied us with everything we needed for a creative day out. Canvas, acrylic paints, paintbrushes, apron, everything. We even had a glass of wine each. There were 2 instructors there to help us and the theme of the day was Hot Air Balloon. We were free to follow and there would be some basic step-to-step guidance on the drawing of the theme. 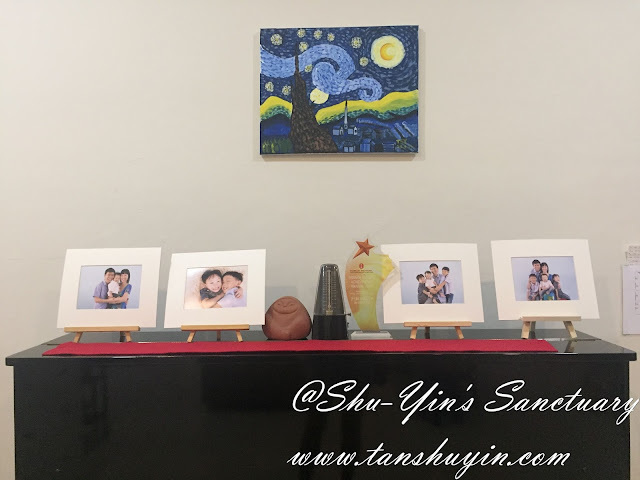 They also encouraged us to deviate from the painting, to make it unique and special to us. But of course we were free to paint anything else we wanted. 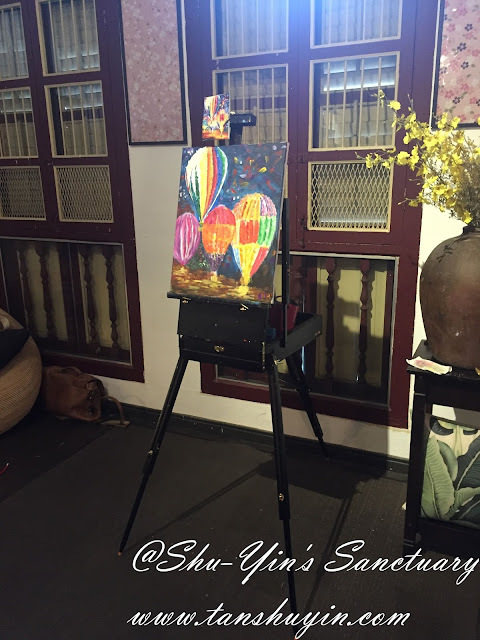 I did not paint the hot air balloons because it didn't bring any meaning to me. Maybe after I'd visited Cappadocia in Turney then I'd be painting that. 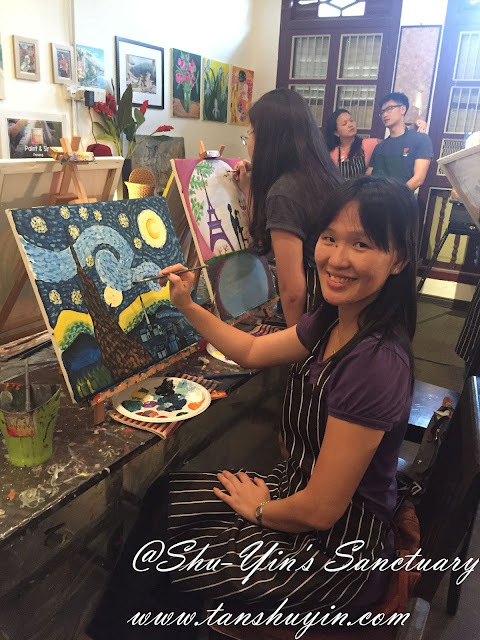 Shern had been learning about arts in school and he had been crazy about Van Gogh's Starry Night. 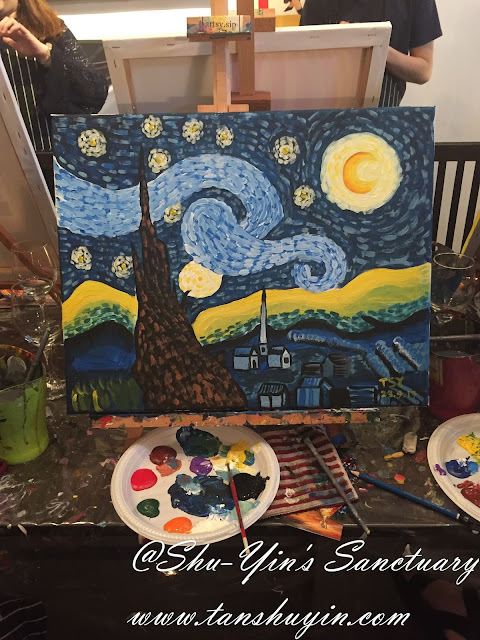 He'd even did a small painting of that in school, and in this year's Learning Log cover, he had drawn the Starry Night using marker pens. 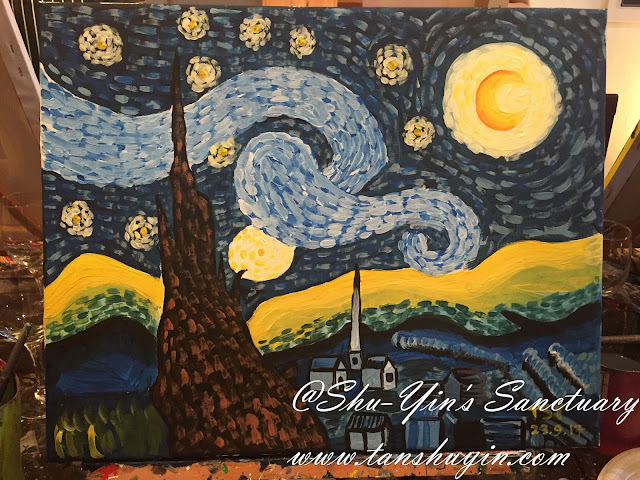 And so I decided to paint my take on Van Gogh's Starry Night! 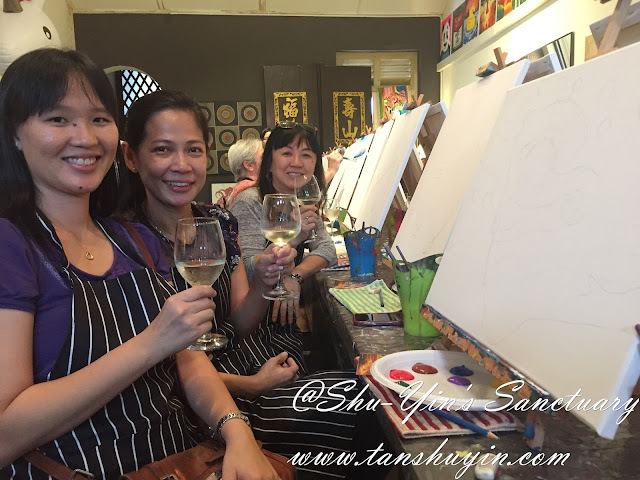 Firstly, took a sip first with my mum and Sew Foong sitting in front of our blank canvases. You could see the faint sketches I made to my drawing. On where the moon and starts and tree and swirls should be so that I could get the proportion right before I started painting it. It was such a relaxing 3 hours. 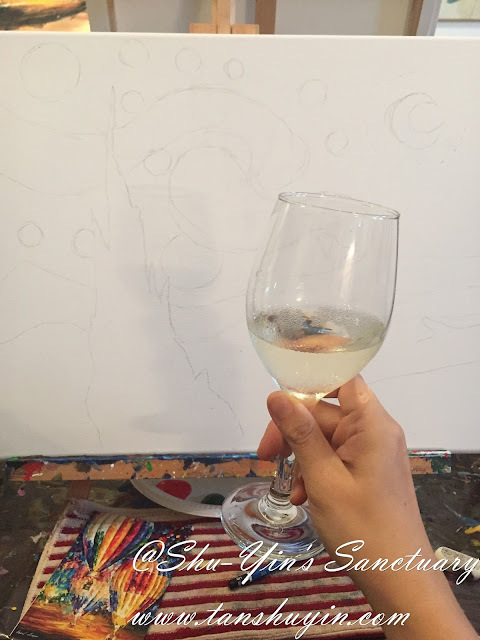 We just painted and chatted and sipped (though my half glass of wine finished in like 1/2hr!). I must admit that I was a little nervous and as well. I didn't paint since I last left high school and that was like 18 years ago. Maybe even more because the last I did art class was in Form 3. Hahaha. And I was intimidated by the large blank canvas staring at me! 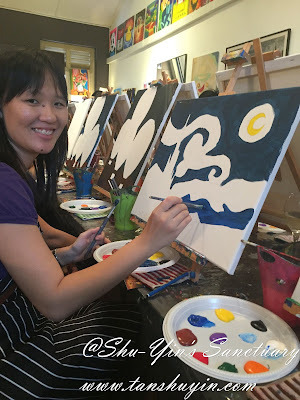 But once I started painting, it got easier and then I got more daring to just mix the colours and paint and paint and paint. And this is the end results after 3 hours. I added my name at the right corner of my painting and also the date for memory sake! This is the class in progress. 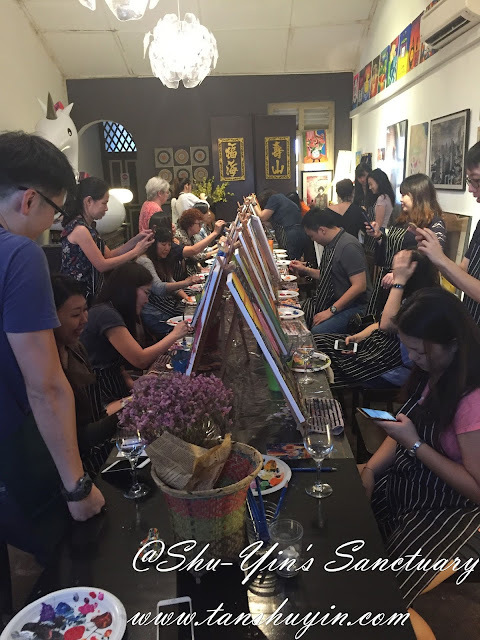 You see, lotsa people here to just relax and paint as well. A mixture of young and old and women and men. And this is the instructor's take on the hot air balloon. 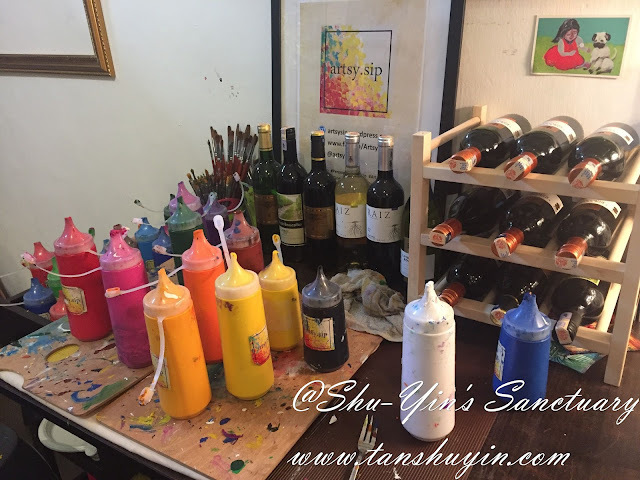 The acrylic paints and brushes and wine. 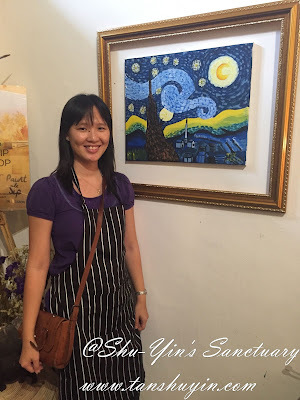 And when I brought it home, Shern told me, "wah....nicest Starry Night ever". 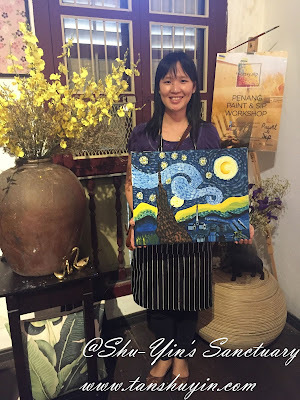 Have a try there and release the artistic side of you! p/s - Please take note that advance reservation/booking is needed. ***Please take note that this post is NOT sponsored. 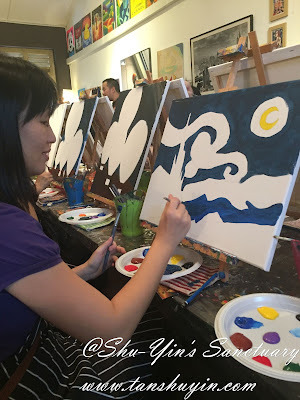 I paid for this Art and Sip session with my own money. All text and opinions are of my own and represents my honest opinion of the product(s)/service(s).